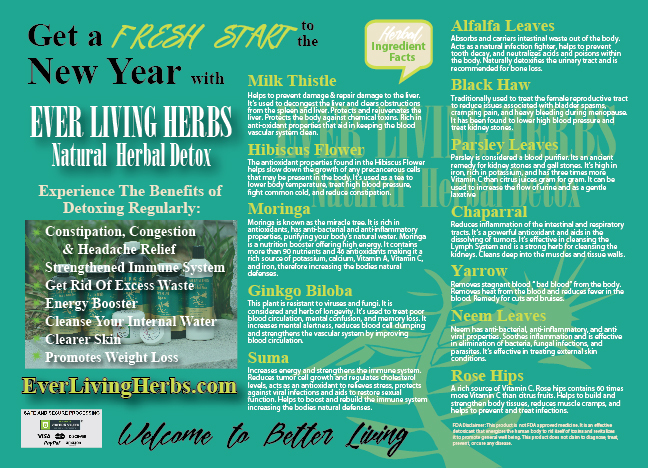 Ever Living Herbs is a health conscious company and are genuinely concerned about the wellness of our clients. A lot of care and thought goes into everything we do. Everything done is with a purpose of providing healing to a nation. Our goal for generations is and has remained the same–To help to maintain and restore the body to its general well-being. Our clients overall health is important to us. We want to provide our clients with an all-natural product(s) they can trust. We want to see our client’s challenges diminish by offering alternative products that do not include artificial additives or preservatives. Artificial additives or preservatives break down the body and impair its normal functioning. Our products are formulated with our client’s health in mind. We want to be able to change the lives of every client we meet by offering them a quality product which improves their quality of living and is formulated with their health in mind. The elements of our logo include the sun which represents the symbol of life, the mountain which represents rest, refuge, and a place where the purest of all elements can be found, and the Nyame NTI symbol for faith and trust in God. We want to move our clients away from products that have harmful side effects and can sometimes leave them with debilitating illnesses. We want to keep clients informed of many uses and benefits of all natural herbs. We research continuously to find herbs to connect our clients to all natural products that will help them on their quest to healthier living. We select herbs that will work harmoniously together to yield maximum results with just one bottle. It’s important that we meet the needs of our clients and produce a quality product with every process. We wanted to bring forth a healthy and safe product that would address but eliminate our clients concerns. While detoxing is important, we also focus on replenishing vital nutrients needed to keep one’s body at optimal best. 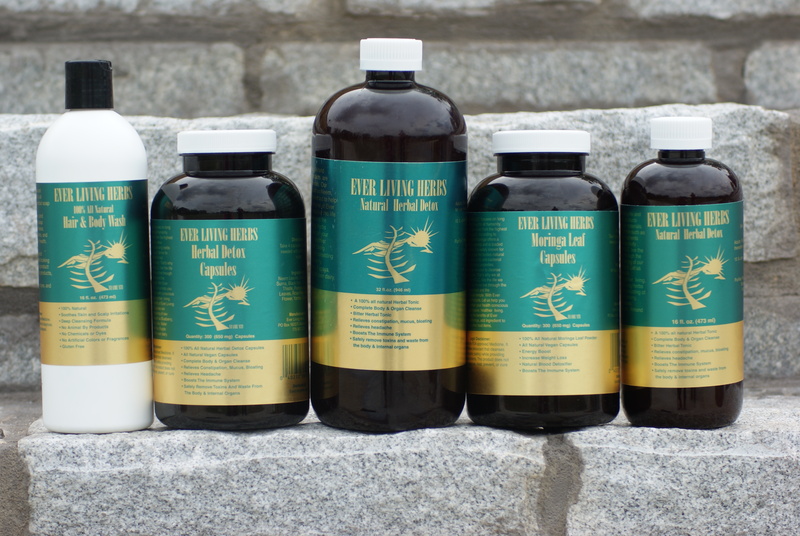 Our detox products are not laxatives but will eliminate constipation, processed foods, heavy metals, congestion, and parasites. Ever Living Herbs contain anti-viral, anti-bacterial, anti-fungal, and anti-inflammatory properties that work to reduce joint pain, inflammation, food poison, bloating, water retention, mucus and headaches. Weight loss, increased energy and stamina are common effects of using Ever Living Herbs Products and a great indication of internal cleansing. We only use 100% all natural sustainable organic herbs that work harmoniously to gently and safely cleanse the body. We always use high quality raw ingredients that help to purify one’s system and flush harmful toxins. Ever Living Herbs Detox can be applied to the skin and scalp to reduce skin and scalp irritations. One of the ingredients used in the detox is Neem which is known as the curer of all ailments because of its healing properties. We offer a capsule form of the liquid detox. The herbal capsules were formulated with the same ingredients as the liquid detox. It is designed to give clients an alternative to the bitter taste of the liquid detox. The capsules will yield the same results as the liquid when taken as directed. The herbs were chosen based on their healing properties and the ability to remove waste and toxins from the body, therefore promoting healthier living and weight loss. We offer Moringa Oleifera Capsules as well. Moringa is known as a super food and for its ability to increase the body’s natural defenses because of its anti-bacterial and anti-inflammatory properties. The ingredients used are 100% organic moringa with no additives allowing for safe and gently detoxification of the body. Moringa is a rich source of minerals and essential amino acids further validating its ability to protect against debilitating illnesses. The results are immediate due to the use of the nutrient rich herb’s ability to promote toxic waste removal from the body. Moringa purifies the body’s internal water and delivers vitality to one’s system. We love what we do and it’s our pleasure to connect our clients to products that promote healing. Every batch is made to ensure the quality and potency of the products. Herbs are chosen by their ability to target certain health conditions. We believe in producing quality products with no harmful side effects on the body. That is why we at Ever Living Herbs live the life we love and love the life we live.